My 20th strip! It’s something of a milestone for me. I’m so pleased that I’ve made it this far. Oh, the fickleness of youth. Maybe there’s hope for poor neglected WW2 after all? Jack didn’t give up his love of WW2 for long did he? My pal Niall and I really went to town ‘decorating’ our desk in National (primary) School. How on earth did we get away with it? 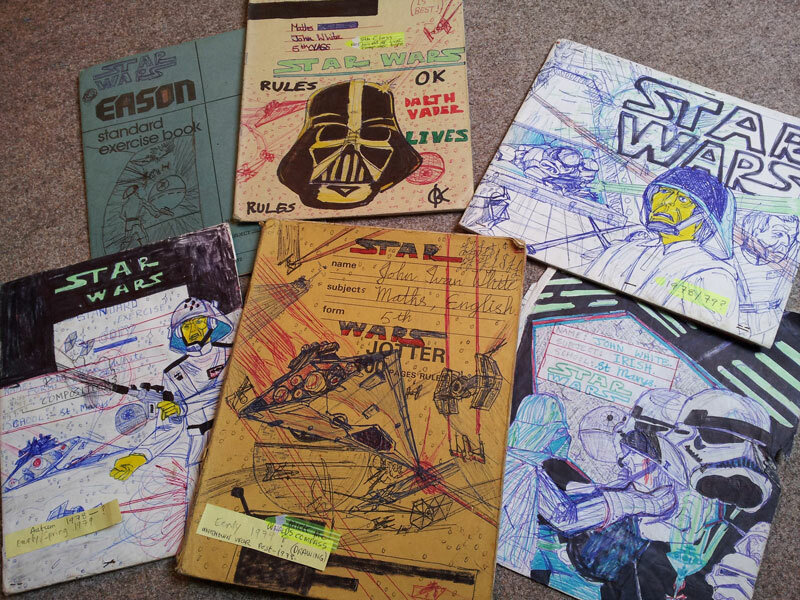 For an entire year – and this would even have been when the school headmaster was teaching 6th class – we scrawled Star Wars and Space 1999 stuff all over it. And guess what? We sat at that same desk all day, all year round. So it was our desk. It was clearly we who were doing it! As the 2 class artists, there could be no doubt as to who was responsible. Sometimes I wonder if we were operating under some sort of unspoken ‘license’ because we were talented! And when I consider all of the schoolbook defacement – it amazes me how a blind eye was turned to it. Once, our class was instructed to draw the ‘Gates of Paradise’ during religion class (a class in which I took little interest, being a non-believer). What did I do? I drew the attack on the Death Star – from Star Wars – and titled it: The Gates of Hell: X-Wings, TIE Fighters, gun turrets and all. One of these days I’ll find that picture in my archives and share it with you all. To the headmaster’s credit, he actually complemented the artistic ability which I’d shown – aloud, in front of the entire class. Decades later, as an adult, I bumped into him – after he’d retired – in the local pub and he kept assuring me, whilst waving his finger: “You’re sitting on a goldmine boy – on a goldmine.” I haven’t found it yet. Maybe I need to be able to find my arse with a flashlight first – then I might find the ‘goldmine’. It never occurred to me that we couldn’t draw on the desks. They were ancient woodwormed things. Perhaps we were covering the other offerings of “Mr * is an ould b****x”. I remember Fozzie had a red Keffiyeh and taught me how to say “my **** up your ****” (an insult) in Arabic. It sounded sort of like “mizubar fatizeh”. Nice. You make a good point! Star Wars and Space 1999 was preferable to slander! Hi John. I love it that the new guy has fair hair but a Starsky sweater — like me, actually. I had more of a Hutch colouring but got my mum to knit me a wraparound sweater – I think you could buy a pattern for one just like Starsky’s. What with Starsky & Hutch, the Fonz, Travolta etc, young people in the 1970s had some pretty vain role models! Excellent strip. I love Jack’s vision of a UN peacekeeper. (Don’t think I’ve ever seen crossings-out in a speech bubble before.) I’m looking forward to seeing how things develop from here. Ha, that’s great Darren! Do you think Hutch was the one we wanted to ‘look’ like – but Starsky was one we wanted to ‘be’? I always remember him nonchalantly and coolly closing the door behind him with his toe as he walked out of the chief’s office. It was something I did from time to time, so impressed was I by it. Dammit, I really want to get a box-set of episodes now! That’s brilliant that he was fair like that. My friend Brid Og and I got away with not paying any attention whatsoever in maths class (in our final year in secondary school) and spent the entire time doodling because the teacher knew we were very good at art (and I was very good at English) and therefore were not morons but had a sort of mathematical dyslexia.